The 3rd Generation Partnership Project (3GPP) unites [Seven] telecommunications standard development organizations (ARIB, ATIS, CCSA, ETSI, TSDSI, TTA, TTC), known as “Organizational Partners” and provides their members with a stable environment to produce the Reports and Specifications that define 3GPP technologies. The project covers cellular telecommunications network technologies, including radio access, the core transport network, and service capabilities - including work on codecs, security, quality of service - and thus provides complete system specifications. The specifications also provide hooks for non-radio access to the core network, and for interworking with Wi-Fi networks. 3GPP specifications and studies are contribution-driven, by member companies, in Working Groups and at the Technical Specification Group level. The Working Groups, within the TSGs, meet regularly and come together for their quarterly TSG Plenary meeting, where their work is presented for information, discussion and approval. Each TSG has a particular area of responsibility for the Reports and Specifications within its own Terms of Reference (Details available in the Specification Groups pages). The last meeting of the cycle of Plenary meetings is TSG SA, which also has responsibility for the overall coordination of work and for the monitoring of its progress. 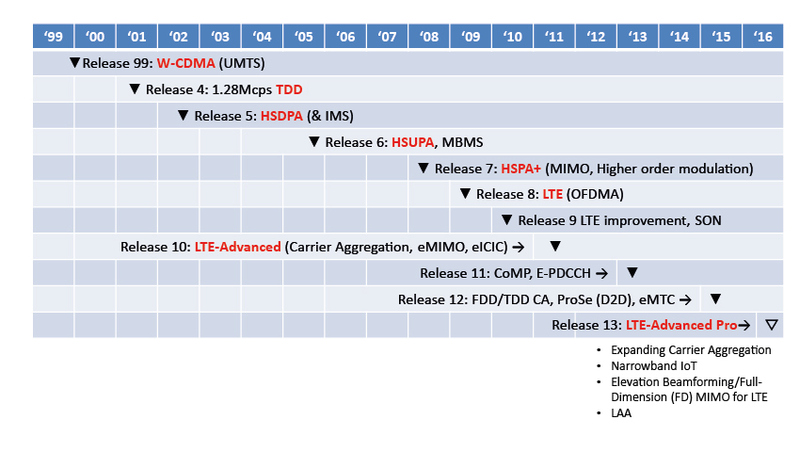 The 3GPP technologies from these groups are constantly evolving through Generations of commercial cellular / mobile systems (see table below). Since the completion of the first LTE and the Evolved Packet Core specifications, 3GPP has become the focal point for mobile systems beyond 3G. Although these Generations have become an adequate descriptor for the type of network under discussion, real progress on 3GPP standards is measured by the milestones achieved in particular Releases. New features are ’functionality frozen’ and are ready for implementation when a Release is completed. 3GPP works on a number of Releases in parallel, starting future work well in advance of the completion of the current Release. Although this adds some complexity to the work of the groups, such a way of working ensures that progress is continuous & stable. The major focus for all 3GPP Releases is to make the system backwards and forwards compatible where possible, to ensure that the operation of user equipment is uninterrupted. A good current example of this principle has been the priority placed in the working groups on backward compatibility between LTE and LTE-Advanced, so that an LTE-A terminal can work in an LTE cell and an LTE terminal works in the LTE-A cell. All of these advances have provided a high degree of continuity in the evolving systems, allowing existing equipment to be prepared for future features and functionality - delivering higher data rates, quality of service and cost efficiencies. Each progressive 3GPP radio access technology aims to reduce complexity and avoid fragmentation of technologies on offer. GSM networks used circuit-switch telephony initially, with packet-switching added with GPRS. In the UMTS architecture, this dual-domain concept was kept on the core network side. Some network elements were evolved, but the concept remained very similar. When considering the evolution of the 3G system towards LTE, the 3GPP community decided to use IP (Internet Protocol) as the key protocol to transport all services. It was therefore agreed that the Evolved Packet Core (EPC) would not have a circuit-switched domain but that the EPC should be an evolution of the packet-switched architecture used in GPRS/UMTS. 1G Analogue technology, from the 1980s onwards. 2G First digital systems, deployed in the 1990s introducing voice, SMS and data services. The Primary 2G technologies are: GSM/GPRS & EDGE, CDMAOne, PDC, iDEN, IS-136 or D-AMPS. The 3G system from 3GPP is based on evolved Global System for Mobile communication (GSM) core networks and the radio access technologies that they support. This has allowed for the maintenance and development of GSM, with the evolution of General Packet Radio Service (GPRS) and Enhanced Data rates for GSM Evolution (EDGE), as well as further developments with the Universal Mobile Telecommunications System (UMTS) and High Speed Packet data Access (HSPA). 3G brought a global vision to the evolution of mobile networks, with the creation of the ITU's family of IMT-2000 systems which included EDGE, CDMA2000 1X/EVDO and UMTS-HSPA+ radio access technologies. LTE and LTE-Advanced have crossed the “generational boundary” offering the next generation(s) of capabilities. With their capacity for high speed data, significant spectral efficiencies and adoption of advanced radio techniques, their emergence has been the basis for all new mobile systems from Release 8 onwards. It should be noted that LTE-Advanced (From Release 10) is 3GPP's ITU-R IMT-Advanced radio interface. LTE-Advanced is the first true 4G technology to be specified by 3GPP. LTE-Advanced Pro is the name that helps the industry describe what has been achieved with the completion of Release 13. LTE Pro is set to be used by other sectors, beyond telecoms, including Critical Communications (blue light services & other Mission Critical systems), the machine-to-machine or Internet of Things (IoT) sector, Transport (Rail, ITS, etc), Education and many other areas. LTE-Advanced Pro is 3GPP's stepping stone to 5G systems. The introduction of 5G will be the result of improvements in LTE, LTE-Advanced and LTE Pro, but this will soon be followed by a major technology step, with the prospect of an entirely new air interface. The first drop of 'New Radio' features, in Release 15, will form the first Phase of 5G deployments. Full compliance with the ITU’s IMT-2020 requirements is anticipated with the completion of 3GPP Release 16 at the end of 2019 - In Phase 2 of the 3GPP 5G effort. For details of the contents of each Release, see the appropriate ’Release Description’ document (see link at bottom of this page). Details of all 3GPP Work Items are in the 3GPP Work Plan, which provides details of the cooperation between all of the 3GPP groups on "Features", defined as ’new or substantially enhanced functionality which represents added value to the existing 3GPP system’. The original scope of 3GPP (1998) was to produce Technical Specifications and Technical Reports for a 3G Mobile System based on evolved GSM core networks and the radio access technologies that they support (i.e., Universal Terrestrial Radio Access (UTRA) both Frequency Division Duplex (FDD) and Time Division Duplex (TDD) modes). The scope was subsequently amended to include the maintenance and development of the Global System for Mobile communication (GSM) Technical Specifications and Technical Reports including evolved radio access technologies (e.g. General Packet Radio Service (GPRS) and Enhanced Data rates for GSM Evolution (EDGE)). 3GPP was created in December 1998 by the signing of the "The 3rd Generation Partnership Project Agreement". 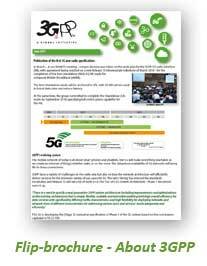 The latest 3GPP Scope and Objectives document has evolved from this original Agreement. The discussions that led to the signing of the 3GPP Agreement were recorded in a series of slides called the "Partnership Project Description" that describes the basic principles and ideas on which the project is based. The Partnership Project Description has not been maintained since its first creation but the principles of operation of the project still remain valid.